Mobile and Social Media Journalism is the go-to guide for understanding how today's journalists and news organizations use mobile and social media to gather news, distribute content, and create audience engagement. Checklists and practical activities in every chapter enable readers to immediately build the mobile and social media skills that today's journalists need and news organizations expect. In addition to providing the fundamentals of mobile and social media journalism, award-winning communications professional and author Anthony Adornato discusses how mobile devices and social media have changed the way our audiences consume news and what that means for journalists. 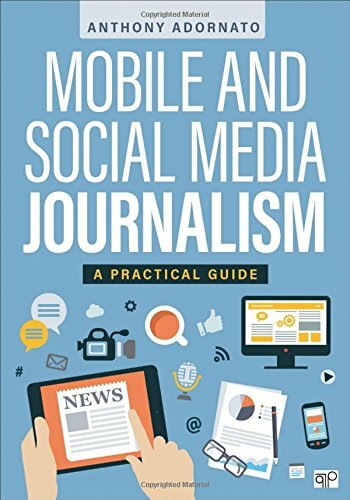 The book addresses a changing media landscape by emphasizing the application of the core values of journalism--such as authentication, verification, and credibility--to emerging media tools and strategies. Checklists are incorporated throughout the book as practical tools for students to apply the chapter content and build his or her professional social media brand. The checklists are classroom tested and some encourage students to tweet the author directly or discuss questions as a class. Practical activities in every chapter provide students with hands-on experience to immediately practice what they are learning and build a portfolio of work that will help kick start his or her career. From the Newsroom features a variety of perspectives and insights from well-known journalists in the field such as David Muir, anchor of ABC World News Tonight, and Hallie Jackson, NBC News White House Correspondent. Additional coverage on the public's active role in the news production process shows students how to locate credible content from social media to enhance reporting, and at the same time, identify misleading and unbalanced content. Tips for developing a digital-first story pitch and increasing social media optimization offer students strategies for creating a plan to use mobile devices and social media while covering stories. Step-by-step instructions on the use of analytics platforms make it easy for students to monitor and analyze the effectiveness of journalists' and news organizations' social media activity. Twitter handles are listed for every journalist and news outlet mentioned in the book, empowering students to interact with the media directly. Social media created for this book, including a Twitter feed (@MobileJourn) and Facebook page (fb.com/MobileandSocialMediaJournalism), give students the latest industry trends and professors tips for teaching the course. A companion website (MobileandSocialMediaJournalism.com) provides an author blog, examples from professional journalists, tutorials, and more.